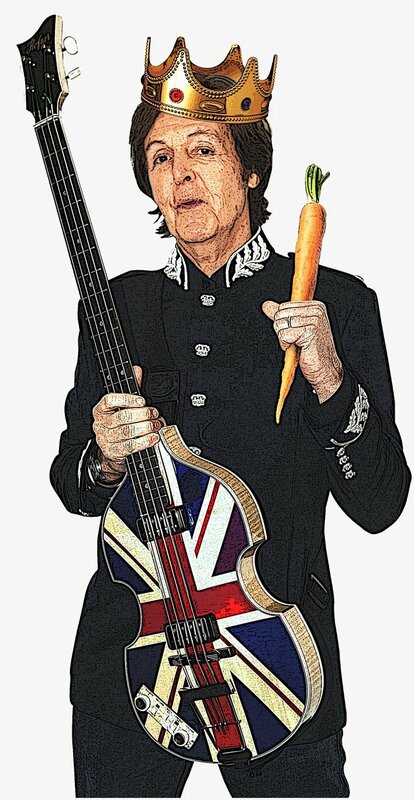 News item: Former Beatle Paul McCartney, a long-time vegetarian, has joined a campaign by animal rights group PETA to encourage Americans to say ‘No, thanks’ to turkey this Thanksgiving. It’s charming that a native of the nation — nay, globe-spanning culinary empire — that gave the planet eel pie, jellied pig’s head and at least a half-dozen authentic expatriate English restaurants feels comfortable telling Americans what we ought to be ingesting on our best-loved national holiday. But — forgo our traditional Thanksgiving turkeys? While we’re at it, should we turn off the Dallas Cowboys game and turn on the Manchester United match instead? Does Man U have cheerleaders? Do they wear high-heeled boots? We respect your principled and passionate devotion to the sanctity of all fish and fowl life. Still, we’re afraid that we can’t comply with your request. Thanksgiving is too important. Too American. Not really yours to influence. You may not be aware of this, being a loyal subject of the queen and all, but the holiday was first celebrated by the Pilgrims — you know, those guys who dressed like oatmeal box models and crossed the Atlantic Ocean specifically to get away from English dudes trying to tell them what to do. More to the point, Thanksgiving turkey is too important. By which we mean: It tastes too good. More than 45 million turkeys will be consumed on Thursday. Twenty-two million more will be eaten on Christmas. We don’t eat much turkey on Super Bowl Sunday — but that says less about our collective palate than the relative strength of the snack chip and guacamole lobbies. It would be one thing if turkeys were, say, endangered. Then we’d leave them alone, like those poor spotted owls. Heck, if turkeys were bald eagles, all majestic and awe-inspiring, we’d put ‘em on stamps and as-seen-on-late-night-infomercial commemorative gold coins. Thing is, domesticated turkeys — the farm-raised ones we eat — are plentiful. And fat. So fat they can’t really fly. (As God as his witness, Arthur Carlson from WKRP in Cincinnati believed otherwise.) In fact, we’ve bred them to be that way. So when one lands on our dinner table, all roasted and yummy, it’s kinda-sorta fulfilling its life’s purpose. Think of it, if it helps, as turkey self-actualization. Speaking of Thanksgiving dinners: You’re married to a woman from New Jersey. Have you been to an American Thanksgiving? Had an entire slate of siblings and in-laws squeezed around a table? Felt the simmering resentments and long-held grudges, now burbling to the surface like lava from Mount St. Helens? Have you ever had to survive for a few hours, at least until it’s no longer unforgivably rude to bail out and catch a movie or find an open bar? Listen up, Sir Paul: It can be hell. Like a lot of things in America, it takes a chemical helper. By which we mean tryptophan, an amino acid found in turkey that contributes to sleepiness. Oh, sure: Scientists insist that the level of tryptophan in turkey is the same as in chicken, and that simple overeating is what actually gives us Thanksgiving drowsiness. Does it matter? As you once sang, we want to be sedated. We need to be sedated. Oh, wait. That was the Ramones. Not the Beatles. Our bad. Anyway, the most disappointing thing about your no-turkey campaign is that it’s so small. Perhaps it’s too much to expect you to think big during the holidays. After all, John Lennon used the season as inspiration for the haunting, seminal antiwar tune “Happy Christmas (War Is Over),” while you came up with the dippy annual December shopping mall standby “Wonderful Christmastime.” Still, we do expect a bit more. A crusade worthy of the Fab Four, or at least worthy of Wings. End holiday hunger. Collect coats for the homeless. Round up and destroy every audible copy of Wham’s “Last Christmas.” Start with solving humanity’s problems, and then worry about flightless birds. Of course, we understand: For you and PETA, birds are people, too. Perhaps you’ll be happy to hear that every Thanksgiving, the president officially pardons one or two turkeys, who then retire to a life of oven-free leisure at George Washington’s estate in Mount Vernon. If that’s not enough for you, we’re sorry. We appreciate your concern, but we’re also rather hungry.